The first year that Mike and his wife, Anne, stayed with us, the airlines lost his luggage for the entire week they were here. 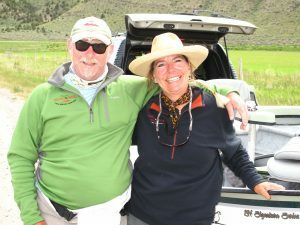 Anne found the Patagonia store in Dillon and Mike quickly became a fashion icon on the rivers he fished. Last year, Mike and Anne returned (their luggage made it too) and both had a terrific time at the Lodge. Today, Mike sent us this photo of himself and guide, Cassandra, along with hope that he and Anne will journey our way again.